Exactly one year ago, Annelise and I moved into a smaller apartment, bringing with us a lot less stuff. Today I’m in a reflective mood, looking back on how our mentality and lifestyle has changed as a result. We spent most of 2016 downsizing, in preparation for a planned year of travel in 2017. Of course, as I’ve written before, things didn’t pan out as expected. But if it weren’t for our original travel plans, we probably wouldn’t be here. We’d likely be in the same place, with the same amount of stuff (or more), so I like to consider our situation somewhat accidental. It wasn’t purely by design. Downsizing was a hugely positive byproduct of the major life events that cancelled our travels. We aren’t minimalists by any stretch of the imagination, but we do manage to live a scaled-down version of the typical consumption-heavy American lifestyle. Read on to learn more about how we downsized, and the subsequent impact it’s had on our lives. When we knew we weren’t going to be traveling, we had to figure out where to live. It would have been an easy choice to stay put, but we knew we could get by with less. So we set out to find our next home. Fortunately, an apartment came onto the market right as our search intensified. It checked all of our major boxes: The location was ideal, it had less space (but enough for us to be comfortable), and it was up-to-date with all major appliances. 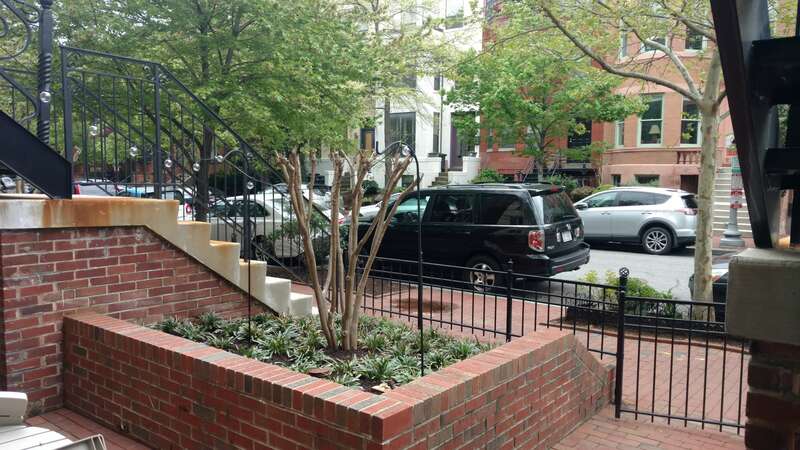 Best of all, the rent was cheaper by $800/month, coming to a savings of $9,600/year. Ultimately, we gave up 150 square feet of living space — going from 930 to 780. What have we given up in exchange for this $9,600 in savings? Aside from square footage, nothing much. The biggest difference is that we no longer live in a large building with fancy amenities. Rather, we now have a single unit in a row house made up of three units. One last photo in our old apartment before saying farewell. Expensive amenities and building fees no longer factor into our rent, and we never made much use of them anyways. We both prefer the vibe of living in a single unit with private access, rather than a large building with long hallways, elevators, and neighbors who barely acknowledge each other. Our apartment has outdoor patio space, and we interact with our neighbors frequently – especially when the weather turns nice. The patio at our new apartment. Who needs amenities? Great people watching right outside of our door. When we were planning to travel, our goal was to survive a year abroad with only carry-on bags. And we didn’t want to leave tons of stuff in storage. With this in mind, we found motivation to get rid of piles (and piles) of clothes. The clothes we got rid of ranged from souvenir t-shirts, to sentimental items that were never worn, to other pieces that constantly went overlooked. The end result is that we each downsized our wardrobes by at least half. It turns out we don’t each need 30 shirts and 10 pairs of pants. A fully-functional wardrobe is possible with surprisingly little. Having a few versatile, functional items goes a long way. When planning for travel, I found shirts that can be used for hiking or a night out. This helped to show me how much I already had, but didn’t need. One of at least a dozen cartloads of stuff, waiting to be taken to Goodwill. In addition to clothes, we got rid of some larger pieces of furniture. This includes a love seat, two coffee tables, lamps, and a desk/office chair. These things had to go out of necessity – our new apartment simply didn’t have room for them. But we haven’t missed them, and our essential needs are more than covered by what was kept around. A perfect example is our guest bed, which comes in the form of a futon and doubles as our couch. When Annelise and I first moved in together, we combined our histories — everything we had accumulated in our separate lives. We had separate sets of dishes, silverware, bakeware, and tools. Not to mention the bigger-ticket furniture items. There were many things we both owned, but no longer needed two of once living together. We eliminated some redundancies, but many things stuck around for lack of a compelling reason to get rid of them. Our mentality was: “If there’s room for it, we may as well keep it.” And there was certainly room, so keep we did. As humans, we are bound to our possessions through strong feelings of sentiment and/or nostalgia. It’s easy to toss things away into a cabinet, closet, or drawer. This way, they don’t add visible clutter to our lives, and we avoid facing our conflicted feelings towards having them. Out of sight, out of mind. This is exactly how Annelise and I handled many redundant items when we moved in together. We had tons of storage space in our first apartment, and we used every inch of it. When we felt conflicted about eliminating an item, off it went to a dark corner to be conveniently forgotten. The extra 150 square feet of space in our old apartment was primarily used to store items we never used and didn’t need. When we downgraded our living space, we no longer had the option of hiding these things. It was that much easier to eliminate what we truly had no use for. We ulimately decided to leave it empty, but this went against every instinct we had. It’s amazing how we had to actively fight this instinct to consume, in order to make the most optimal decision. Had we filled that space, it would have been money wasted on a manufactured need. Space alone doesn’t dictate a need, but it does make us yearn to create one. And we usually do just that. Then, the added stuff becomes more to deal with in the future. We have enough to deal with in our lives as it is, why add useless stuff on top of it? This insight was a canary in the coal mine; it helped us realize we really didn’t need as much space as we thought. It certainly enabled our decision to downsize when our lease expired. We aren’t tiny-house dwelling minimalists, but that isn’t to say we don’t admire those who are. There’s lots to learn from the ideals behind that lifestyle. By living more reasonably and keeping consumption in check, we’ve made positive changes without subtracting from our quality of life. For Annelise and I, the aim is focused on independence and flexibility. The less our stuff weighs us down, the more we have of both. There’s more time to prioritize what matters, rather than maintain belongings or seek out new ones. We have more money as a result of getting off the hamster wheel of consumption. We have more freedom to move about as we wish. 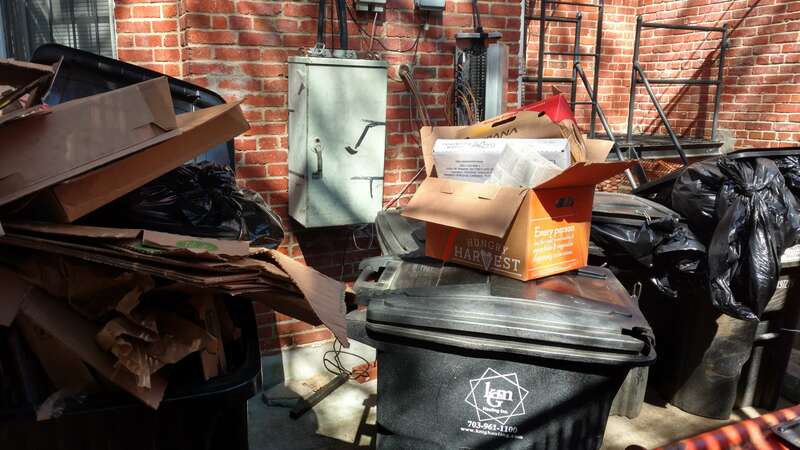 A weekend’s worth of trash…for just six apartment units. That’s a lot of trash, and it can’t be good for our planet. A dream we share is to one day have a paid-off house that can be left behind at a moment’s notice. This was largely inspired by Bea Johnson and her zero-waste lifestyle. We recently saw her speak, and her lifestyle is extremely inspirational. 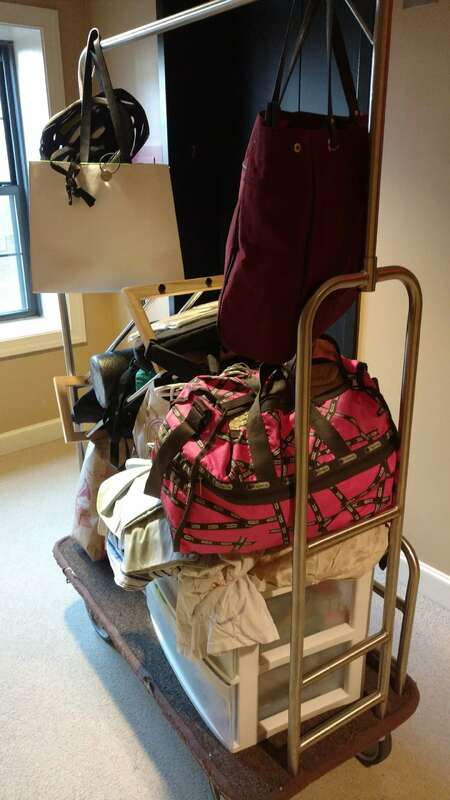 Bea and her family are able to pack their belongings into single individual bags, leaving their immaculate house to be rented out for extended periods of time. The resultant cashflow can fund such expeditions (or at least a significant portion of them). Annelise and I make an effort to consume and waste less, but we still consume and waste alot. This makes me anxious to think about how wasteful our society is. We have a long way to go to be on Bea’s level, but it’s important to take incremental steps forward. Making small but intentional decisions every day can reduce our consumption and waste on a large scale. By making an effort to downsize our lives, Annelise and I have gained clarity on what we want most. In getting rid of physical clutter, we’ve reduced the noise that distracts from this clarity. We still have lots of work to do, but are on the right path. Our culture thrives on consumption and waste. I see this firsthand every time I take the trash out, entering an alley full of junk destined for the landfill. Boxes, lamps, mattresses, furniture pieces, old toys and electronics. Bags upon bags of trash. And this is only for a handful of residents! I abhor being part of the problem, and shudder at how big the problem is. But one realization helps me keep improving: Living with less is a win-win, it makes us happier and is kinder to our planet. Large-scale change will be possible once this is widely understood and accepted. Consumption is not an entitlement. Rather, it is a distraction from the things that matter most. It isn’t un-American to refrain from mass consumption, even though mainstream beliefs will tell you otherwise. It’s shocking how often we sacrifice individual freedom in the pursuit of bigger, better, and more. When our stuff owns us, it’s impossible to follow our dreams. Remember this when deciding what to bring into your life from now on. Love this! 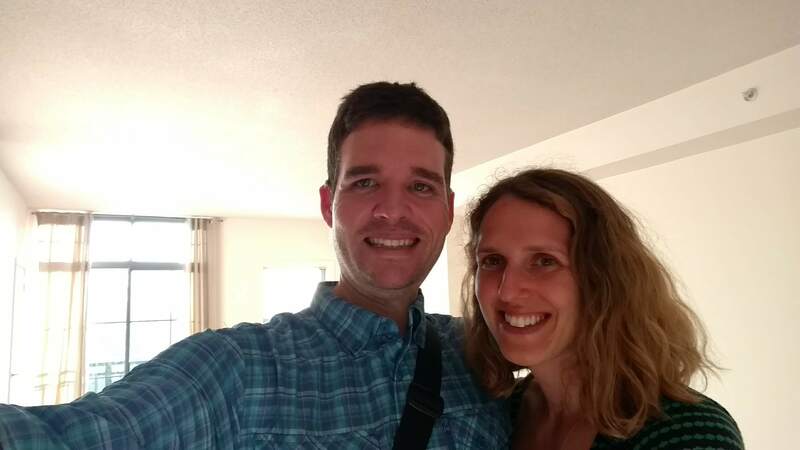 We thought about buying a bigger house years ago but ended up staying in our smaller home that’s actually just the right size for a family of four. Not only did we keep our housing budget much smaller with this decision, we also prevented an accumulation of unnecessary stuff that inevitably happens when you have the space for it! That’s awesome Katie. I totally agree. How big is your house? We think we could have a family of four comfortably in 1300 square feet or so. But your inputs would shed light on how solid our estimate is. I don’t know the exact square footage of our house but I would estimate it to be around 1500, give or take and we’ve currently got a 4 year old and 6 year old. If you aren’t looking for a mansion then 1300 would probably be just fine! To be honest, I think more than the actual square footage, it comes down to more of the ways you want to use the space. Each of our kids has their own small bedroom and we have ours and then we have the kitchen/dining area and family room as common rooms. It’s the perfect amount of space to allow for people to have alone time but also to be together! Consumption as distraction! Absolutely, yes. I wrote something very similar in a blog post that’s pushing tomorrow – I’m finding a lot of similarities in our thoughts as presented on our blogs. Really enjoyed this. I love my 700 sf condo! And we are STILL purging. I love this idea of being okay with empty space in a home. I need to start decluttering again, and your post is definitely inspiration! Thanks Andrew! I’m looking to do more decluttering too. It’s a never ending journey! 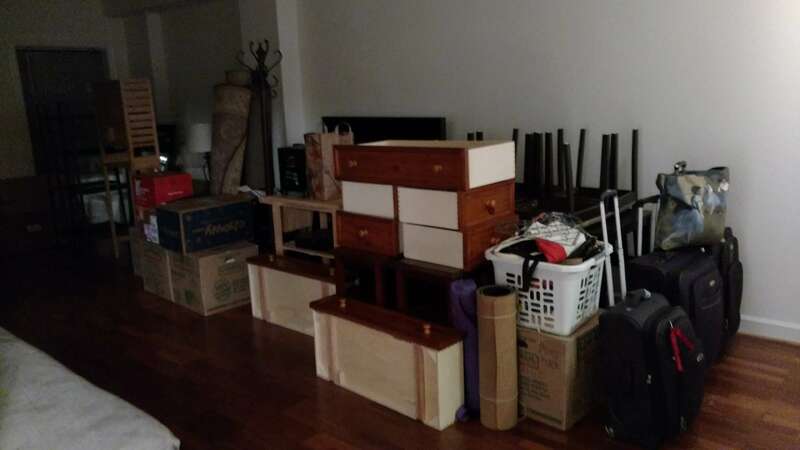 In fact writing this post inspired Anna and I to get rid of even more stuff.